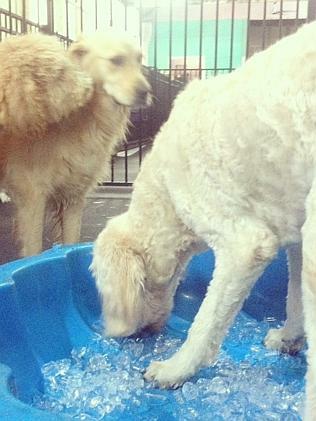 SOUTH Melbourne’s Diggiddy Doggy Daycare centre has become a crisis centre for heat-stricken pooches. Owner Nicole Farren said distressed dog owners without air conditioning were turning up at the centre seeking refuge, as the five-day heatwave approached its peak. “We’re getting a lot of demand, but we’ve been fully booked since November,” Ms Farren said. 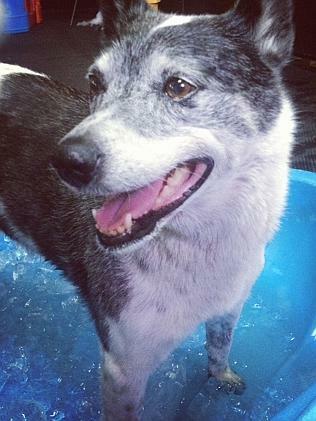 << Worried about your pet in the heat? Read more tips here. She said the centre was trying to free up space for those dogs who desperately needed to find refuge from the soaring temperatures, set to reach 44 degrees today. “If dogs have got the option of staying at home, and their owners have got air conditioning, we recommend that they stay there so we can take dogs where people have got no other choice,” Ms Farren said. She said high-energy play activities had been suspended, with pooches instead encouraged to splash in the pool and offered liver-flavoured frozen treats. “If dogs have been exercising all day and there is no relief overnight – if they don’t have air conditioning at home – that’s when heat exhaustion can kick in,” Ms Farren said. The dog-loving entrepreneur said she had taken several dogs into her home, sleeping in the kitchen as “the rest of the house was over 33 degrees”. “Last night really scared me,” she said. * Watch the signs of heat exhaustion, such as heavy panting, drooling, mild weakness, increased heart rate, seizures, vomiting and diarrhoea. * Bulldogs, Boston terriers, pugs and other short nosed breeds are more susceptible to heat exhaustion. * Tiled floors provide dogs with a nice cool place to lie, if you can have the dogs in an air conditioned cooler room of the home. * If your dog is kept outside, make sure they have adequate shade and soak a towel in cold water and leave it for them to lie on. * Brush your dog out regularly, but long-haired dogs should not be clipped (their coat is insulating). * Do not walk your dog in the middle of the day. * Try and limit car trips and never leave your dog in the car. Barney has been coming to daycare since he was 9 months old and he's now 10 - one of the "old guys"! We love everything about Diggiddy - all the staff are so caring and enthusiastic and they provide a brilliant environment for socialisation, play and rest in the bright Brady Street premises. If you're thinking about trying daycare for your pup, don't hesitate!